Molecular Hydrogen converts the body’s most harmful free-radicals to water. Molecular Hydrogen regulates the body’s antioxidant systems including SOD and Glutathione. Molecular Hydrogen supports cell metabolism, cell-signaling and gene expression. Active H2 – A Tablet that Infuses Water with Molecular Hydrogen, H2! An additional benefit is that Active H2 generates an electron-rich potential (-ORP) in the water (you can measure it!). This rare property is uniquely found in fresh, raw living foods and juices, mothers milk and many of the world’s healing waters. 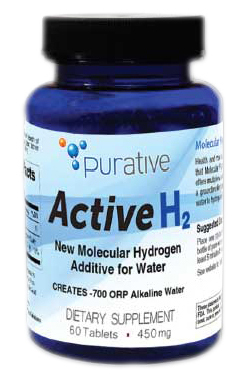 The ACTIVE H2 Molecular Hydrogen tablet is a significant and proven health-promoting nutrient when reacted with water. Before preparing a bottle of H2 infused drinking water, choose one of the recommended water types described under footnote (2). Add the tablet to a completely full bottle of water and observe the abundance of hydrogen micro-bubbles rising from the reaction. If you use a plastic bottle with a tight sealing cap, it will become pressurized and very firm. For best results, wait 10-15 minutes for the tablet to react completely then consume the H2 infused water within several minutes. Chilling the water helps maintain the potency of the Molecular Hydrogen for a longer time and improves taste. General Use – Place one (1) Active H2 tablet into a 12-16 ounce bottle1 of drinking water2 filled to the top. Allow the tablet to react for 10-15 minutes before consuming. Chilling the H2 infused water helps maintain its potency longer. Optional General Use With Fruit or Vegetable Juice – Place one (1) Active H2 tablet into a 12-16 ounce bottle1 of fruit juice or vegetable juice3 filled to the top. Allow the tablet to react for 10-15 minutes before consuming. Chilling the H2 infused juice helps maintain its potency longer. 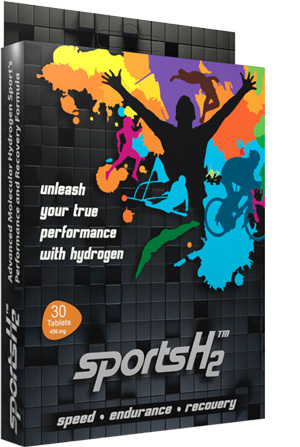 Sports and Athletic Use – Place one (1) or two (2) Active H2 tablets into a 12-16 ounce bottle1 of drinking water2 or electrolyte sports drink filled to the top. Allow tablet(s) to react for 10-15 minutes before consuming. Chilling the infused water or sports drink helps maintain its potency longer. Maximum Potency – Place one (1) or two (2) Active H2 tablets into a 12-16 ounce bottle1 of drinking water2 filled to the top. Allow tablet(s) to react in the refrigerator for at least 30 minutes to develop maximum potency and stability. NOTE: Magnesium mineral residue will be observed on the bottom of the bottle after several Active H2 tablets are reacted. This residue can easily be removed by simply pouring in a small amount of white vinegar, sealing the top and agitating it until the residue dissolves. Rinse the bottle with clean water. Try ACTIVE H2 infused water before activities to limit oxidative reactions and afterwards for more rapid recovery of physiological function. Consult with your health practitioner and search for Molecular Hydrogen health support applications on the Internet. ¹Plastic, glass or coated aluminum with screw on cap with seal. It is imperative that the seal prevents the escape of hydrogen gas during the reaction. ²Water can be distilled, RO, purified, spring or potable tap water. Sparkling water and high mineral content (>500 ppm Total Dissolved Solids) water should not be used. ³Fruit juice or vegetable juice can be fresh or prepared. Do not use Active H2 with juice blends, smoothies or protein drinks.